Our 2011 Burnside Road Pinot Noir, Mendocino County is composed of carefully selected Anderson Valley fruit. This northern California grape-growing outpost is becoming known for its full, round berry flavors and deep, rich wines. These grapes were hand-picked and then carefully sorted prior to crushing. The resulting juice was kept at fifty degrees for the first five days to extract extensive flavors and complexity. The wine went through a long, cool fermentation to highlight bright red fruits and a spiciness on the palate. It was then gently pressed before being aged in oak barrels for the next 20 months. 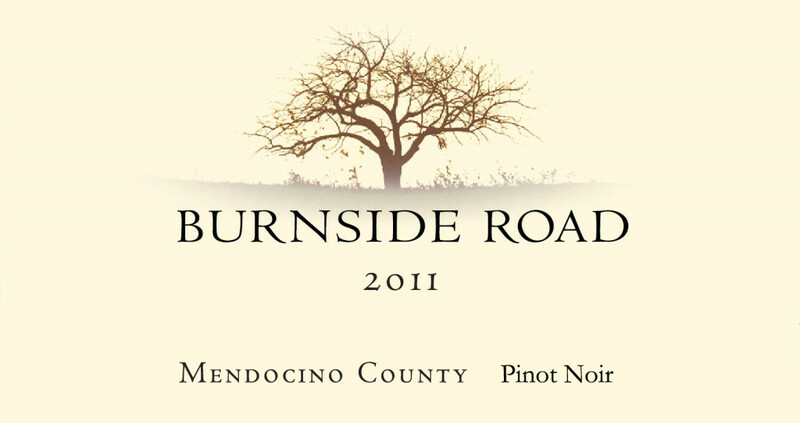 The resulting 2011 Burnside Road Pinot Noir, Mendocino County offers alluring aromas of cedar, cigar box and damp forest floor, along with nuances of bright cherry and cranberry. A finely-structured Pinot noir, it retains an elegance and pairs extremely well. Enjoy it now or cellar for 2-3 years.